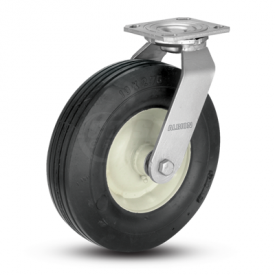 Designed to meet the varied needs of the aviation ground support equipment industry, the 298 series sets the standards. 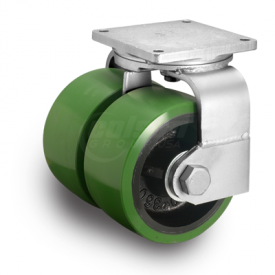 Constructed with an oscillating, compensating wheel axle and cushion suspension leveling, these casters can stand up to even the most rigorous conditions. All optional features can be installed at the factory without an increase to order lead time. A spring assembly can be retrofitted at a later date; please consult factory. The swivel lock and face contact brake are field installable. 2-1/2″ oscillating axle, precision-machined at each end to accommodate 2″ tapered bearings in wheels.